It isn't often that the legendary Bob Dylan visits these shores - after all, he's on a never-ending jaunt around the world and there are only 365 days a year, right? (OK, 366 for a leap-year, fact-fans). But for autumn 2013, Robert Allen Zimmerman will celebrate his 72nd year on the planet with another leg of shows. But not just any old leg - this one is unusual in that it crams nine shows into three towns. The first trio will take place at Glasgow's Clyde Auditorium from 18th to 20th November inclusive, followed by three shows at Blackpool's Opera House from 22nd to 24th November with three final shows confirmed for London's Royal Albert Hall from 26th to 28th November. Tickets are on sale now at various prices. Glasgow tickets start at £70, Blackpool's range from £55 to £70 and London's are the cheapest at £50 to £65. He'll be joined by his band on all dates. His most recent album, "Tempest", appeared in 2012 and drew admiring gasps from the usual critical quarters, as well as earning him his 25th Top 10 studio album in 50 years. 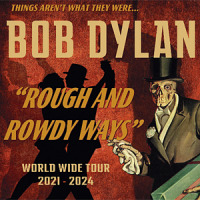 Some of those albums have been folk-rock's most important releases, including "The Freewheelin' Bob Dylan", "The Times They Are a-Changin'", "Bringing It All Back Home", "Blonde on Blonde", Oh Mercy" and his #1 album from 2009, "Together Through Life".